4WD travel has the potential to create more jobs and income in the desert if tourism agencies, businesses, Aboriginal entrepreneurs and land managers work with the markets to expand the range of products and experiences. That’s the conclusion of the first stage of the On Track™ project following 18 months of probing hundreds of real and aspiring desert 4WD travellers. Charles Darwin University’s Dr Dean Carson, project manager, is driving this Desert Knowledge Cooperative Research Centre (DKCRC) project with a team of researchers from CSIRO, CDU, Murdoch, James Cook and Curtin universities. ‘So far, the industry has tended to focus on relatively experienced domestic four wheel drivers who take long trips on the major desert tracks, but the market is more diverse than that,’ he said. At the heart of the study is On Track’s Knowledge Community - a network of organisations providing information that is used to inform marketing and management practices. Research has revealed visitors who were looking to combine special interest areas such as bushwalking, bird-watching and fossicking with a 4WD trip. Others were motivated to test their driving skills and vehicle capabilities while other ‘novice’ 4WD travellers wanted short, supervised experiences as part of an overall holiday. This neglected group was likely to include many international visitors and ’incidental’ 4 wheel drivers such as caravaners. Study results show the demand for themed tours, a greater variety of trip structures such as ‘tag-a-long’ tours and driver training experiences may diversify the market. Products appealing to travellers were those offering flexible schedules and tapped into the sense of independence and discovery that characterised 4WD tourists. He suggested tourism businesses should tap into these networks and deliver their messages directly to caravan parks and camping sites as well as using well-established communication networks through clubs, motoring associations, online communities, maps and personal networks. He also suggested desert businesses needed to collaborate to overcome perceptions of high costs and a lack of availability of fundamental goods and services. 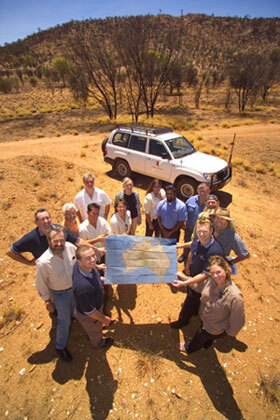 For more information go to www.desertknowledgecrc.com.au/research/4wdtourism.html.